Sometimes, the better is the enemy of the good. This article shows that a coaxial transformer  or a coaxial cable transformer  can be better than a transformer or an autotransformer within a radio frequency power amplifier. Presented is the SPICE simulation of a 600W output power, linear mode class B power amplifier for the frequency range 1.8 MHz to 50 MHz (wave length 160m to 6m). A coaxial transformer is a transmission line transformer (TLT) that uses a ferrite core to improve the lower cut-off frequency of the TLT . The amp works with lossy matching (dissipative equalizer). Ballast resistors are used to dissipate reflected energy within the amplifier. A transmission line and an inductance together simulate a coaxial transformer. SPICE tables are used to model the complex permeability of the ferrite core . The loaded TLT works as common mode suppression (CMS) choke and as a building block for power splitter and 180° hybrid. The push-pull amplifier circuit uses an ordinary 50V, 150W RF MOSFET like MRF151 or SD2931-10. Two amp modules are combined, because one pair of MRF151 can only deliver 300W output power. The bias voltage supply uses a complementary emitter follower to create a low impedance bias voltage. To reduce electromagnetic interference (EMI), a 5th order Butterworth low-pass filter is placed between amp and antenna. The component values for this filter are calculated within SPICE. Figure 1 presents the amplifier. The PA uses a supply voltage Vdd of 50V direct current for the RF MOSFETs. The voltage regulator VR1 generates the bias voltage from a 13.8V supply voltage Vbb. The power splitter PS1 separates the RF input signal Vin into two signals with 0° phase difference. 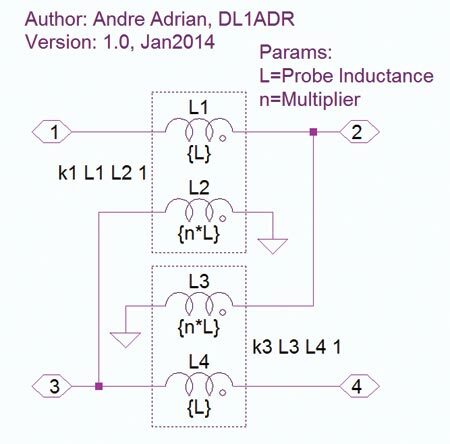 R1 to R4 “repair” the impedance mismatch of PS1, for details see below. The two power amplifier modules PA1 and PA2 provide the action. PS2 combines the two output signals. The low-pass filter LP1 “cleans” the output signal from harmonics. Figure 1 • Coaxial transformer power amplifier overview. Figure 2 shows the complementary emitter follower voltage regulator. The resistor R1 and the zener diode D1 together deliver a stable voltage of 8.2 volts. R2 and R4 work as voltage divider with high impedance. The components D2, R3, D3 keep the voltage between base of Q1 and base of Q2 at a constant value. 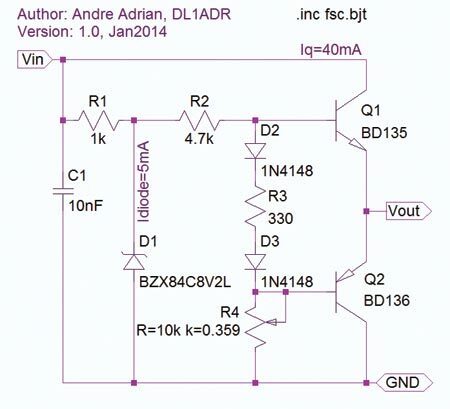 The transistors operate in class AB with a little quiescent current of 40mA. The output voltage Vout can be set between 1 and 7 volt. This circuit fulfills the task of current source and current sink. The feedback loop of the voltage regulator lies within the transistors, between base and emitter. See reference  for the important topic of MOSFET thermal runaway and for a simpler bias voltage supply circuit. Figure 2 • Bias voltage supply. The common mode suppression (CMS) choke or the balun was patented in 1932 by Felix Gerth. He explained the construction and function as: “In line E is inserted a coil arrangement L that consists of two interwound coils, which are wound in the same direction and are closely coupled together. One of these coils is inserted in each of the two conductors of the line E. The inductances of these coils neutralize one another for the counter-phasal currents coming from the transmitter so that in this desired direction the power can flow unhindered. With the co-phasal currents induced by the radiation of the antenna A, however, the inductances are added, so that the currents find a resistance which does not permit them to flow” . The choice of words today is differential, odd or normal mode for counter-phasal and common or even mode for co-phasal. The differential mode suppression (DMS) choke uses the same components as a CMS choke. Just the wiring is different. In figure 5, BA1 and BA7 are baluns and BA4 is a DMS choke. The inductance controls the low frequency behavior of the balun and the length of the coaxial cable controls the high frequency performance. The delay-time of the 50Ω baluns is 1.1ns and the inductance is 12µH. The length of the coaxial cable is calculated from the velocity of propagation and the delay-time. A cable with solid polyethylene dielectric has a wave propagation speed of 66% of the speed of light. The cable length is 22cm or 8.6in. The 25Ω baluns have half the inductance, half the delay-time and half the cable length. All baluns in this circuit use ferrite material 61. The coaxial transformer is a special version of the balun. A low frequency model is given in . Figure 3 shows the SPICE model of the author. A lossless transmission line (TLINE) replaces the ideal 1: 1 transformer that is used in . The inductance of the ferrite core only influences the outer conductor of the coaxial cable. A series resistor simulates the resistive losses of the magnetic material. Figure 3. Coaxial transformer SPICE model. The ferrite material that is used for the coaxial transformer has frequency dependent properties. Chart 1 shows for the Fair-Rite round cable core 2661540002 the frequency dependent behavior of reactance, resistance and impedance. 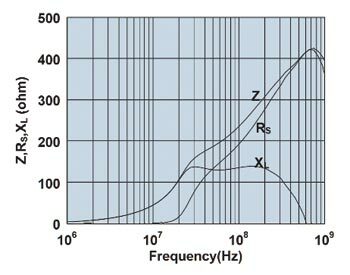 Up to a frequency of 25MHz the cause for the impedance Z lies in the reactance XL. At 50MHz, reactance and series resistance Rs have the same influence on the impedance. Above 600MHz the impedance cause is solely the resistance of the ferrite material. In an ideal inductance, the voltage follows the current with 90° phase difference. The ferrite material 61 behaves this way at frequencies below 25MHz. At 50MHz is the phase difference between the voltage and the current 45°. The equivalent circuit is then a series RL network. Chart 1 • Round cable core 2661540002 characteristics (Copyright Fair-Rite). The ferrite suppliers present this information normally as complex permeability µs, see chart 2. The real part µs’ or µs1 describes the frequency dependent reactance, the imagery part µs’’ or µs2 describes the frequency dependent resistance (ferrite core losses). The reactance and the resistance are calculated with the formulas that are presented in . L0 is the “air core” inductance, the inductance without any ferrite core. Chart 2 • Ferrite material 61 characteristics (Copyright Fair-Rite). “The hybrid transformer represents a four-port device having two input ports, one sum port and one difference port. The unique characteristic of the hybrid transformer is its ability, to isolate the two input signal sources” . The hybrid is an evolution of the Guanella 1: 4 balun. The low impedance connection of the 1: 4 balun is called summary port; the two high impedance connections are called input ports. The 1: 4 balun does have a difference port, but nothing connects here. Clyde Ruthroff informs about an important fact: “In all hybrids in which all four arms are single-ended, it has been found necessary to use two cores in order to get proper magnetizing currents” . The hybrid ports have different impedances. If the coaxial cable has an impedance of Z, the sum port will show an impedance of 2*Z. The difference port has an impedance of Z/2 to ground. The impedance between both input ports is Z/2. The impedance amounts to Z/4 between one input port and the ground. The hybrid uses 25Ω coaxial cable. The sum port impedance is 50Ω, difference port to ground is 12.5Ω and input port to ground is 6.25Ω. 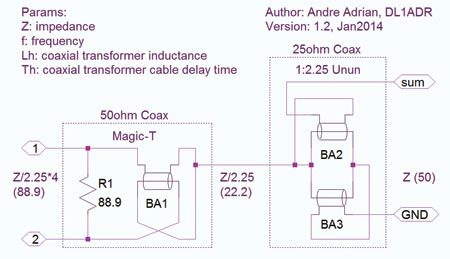 Figure 4 shows that a power splitter is the combination of a Magic-T hybrid and of a 1: 2.25 line transformer. The Magic-T is the DMS choke BA1 with the additional ballast resistor R1. The transformer circuit bases on “Fig. 34” in a patent from Guanella . The two baluns BA2 and BA3 are wired according to the bootstrap method. The two windings of the BA2 are in series connection, as are the two windings of the BA3. The top coil of the BA3 is parallel to the lower coil of the BA2. The top coil belongs solely to the BA2; the middle coil belongs to the BA2 and the BA3 and the lower coil belongs only to the BA3. The low frequency model of this network is an autotransformer with three windings. An autotransformer voltage ratio of 2: 3 gives an impedance ratio of 4: 9. The reciprocal value is 2.25. Figure 4 • Coaxial transformer power splitter. The 2.25 ratio power splitter transforms the impedance of 50Ω into two times 44.4Ω. R1, R3 in figure 1 are an L-pad with 44Ω input impedance and 50Ω output impedance for the first amplifier module; as are R2, R4 for the second. They provide a lossy impedance match, because they transform RF energy into thermal energy (heat). BA1 is a 50Ω balun and BA2 and BA3 are 25Ω baluns. For details see the Balun section. Figure 5 displays the push-pull circuit. Here occurs the direct current (DC) to radio frequency (RF) translation. Hybrid BA1 is a common mode rejection choke. The 180° hybrid consists of BA2, BA3 and the ballast resistor R1. The hybrid sum port connects to BA1. The ballast resistor terminates the difference port. If the RF signals at both MOSFET gates are equal in magnitude but opposite in phase, there is no RF-energy at the difference port. The ballast resistor consumes RF-energy that was reflected. The reactance of a MOSFET gate is individual. These different input reactances are the cause of RF energy at the ballast resistor. C1, C2 connect the hybrid 0° and 180° ports with the MOSFET gates. Figure 5 • Coaxial transformer push-pull circuit. 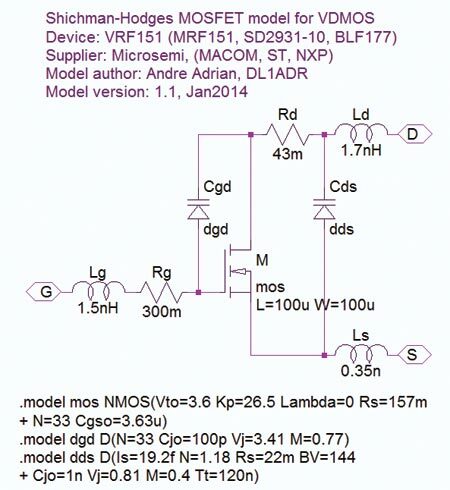 R4, L1 supplies the bias voltage for MOSFET X1 and R5, L2 supplies it for MOSFET X2. The hybrid input ports are terminated by the RL series networks, too. R4, R5 are the last part of input lossy matching. The gate voltage controls the MOSFET behavior. The RF currents that flow into and out from the MOSFET gate are reactive currents or wattless currents. For a MOSFET gate there is no impedance match. Every impedance match transfers electrical power from low voltage and high current into high voltage and low current. A reactance input match is possible. L1 compensates the reactance of the gate-source capacitance Cgs within the MOSFET. Both form a LC-circuit with a resonance frequency above the upper cut-off frequency. The capacitors C3, C4 establish a common RF level for the bias voltage connector, the drain voltage connector and the ground connector. The figure shows that the ground connections of the push-pull circuit come together in one point. There is also a common drain voltage point and a common bias voltage point. The amplifier components placement should be symmetrical; as pictured in the schematics. 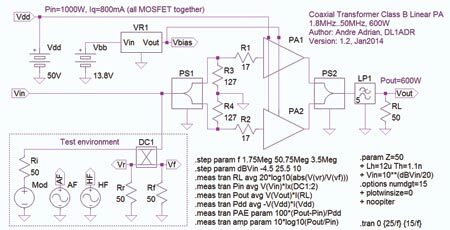 These guidelines help to build a stable amplifier. The push-pull circuit uses bridge neutralization as described in . No capacitive coupling should occur between the MOSFET gate and drain. The differential mode suppression (DMS) choke BA4 connects the MOSFET drain to the supply voltage. The output section C5, C6, BA5, BA6, R2 and BA7 is similar to the input section. The component values are the same, but the components have a higher power rating. The ballast resistor R2 “destroys” the RF energy that is reflected from the low-pass output filter. The even harmonics of a push-pull amplifier are weak, but the odd harmonics are strong. Look at  for a 600W amplifier solution without power splitter. 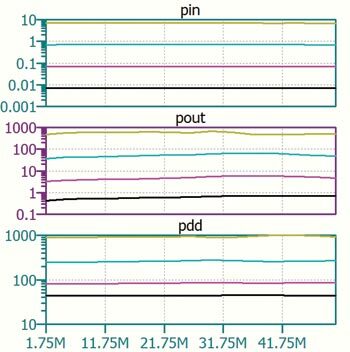 Reference  discusses the individual behavior of RF MOSFET in a push-pull circuit. BA1 and BA7 use 50Ω coaxial cable and BA2 to BA6 use 25Ω coaxial cable. For details see the Balun section. The capacitor C1 is in reality four capacitors in parallel. This is true for C2 to C6, too. The capacitor body creates an inductance. Putting these parasitic inductances in parallel reduces the sum inductance. Every capacitor is, at high frequency, a series LC-circuit and every inductor is a parallel LC-circuit. The RF currents that flow into and out the capacitor connectors are distributed between the parallel capacitors. This current sharing is important for capacitors C4, C5 and C6. Figure 6 • 5th order, Butterworth, low-pass filter. The amplifier uses a Butterworth type, 5th order, low-pass filter, see figure 6. Every 5th order filter has a stop-band decline of 30dB per octave. The pass-band return loss can be tuned to a mediocre value for a large frequency range or an excellent value for a small frequency range. This filter is optimized for the small frequency ranges of the ham bands. The formulas to calculate the components values are very simple. The parameter f in the formula is not the upper cut-off frequency; but the upper pass-band frequency for best return loss. The impedance match is perfect at this frequency. The filter inductances produce losses. The SPICE simulation runs with a Q value of 100 for the inductances. The assumed parasitic parallel capacitance of the coils of 2pF improves in fact the stop-band attenuation. The filter needs two inductances and three capacitors. The spreadsheet table 1 gives the values for some radio amateur bands. The low-pass formulas start with the well-known reactance formulas of capacity and inductance. The line impedance Z is used as reactance at frequency ω, the circular frequency of perfect impedance match. C and L can be calculated now. The following relation is there between the quality factor Q and the series resistance Rs of the inductance. 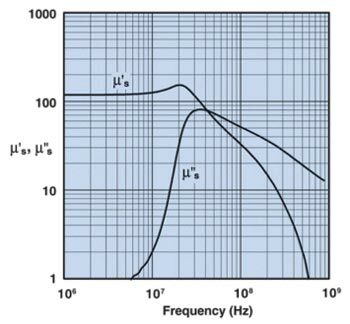 The Q value of 100 gives an attenuation of 0.3dB at the frequency ω. “One decibel is none decibel”, as the knights of the RF table like to say. The test environment is needed to create the power amplifier characteristics charts and to improve the SPICE simulation speed. The three components Mod, AF and HF give the input voltage a specific envelope curve. At simulation start, the input voltage is very small. It grows exponentially up to the intended value. This startup behavior helps SPICE to settle quickly to a steady state output voltage. DC1 is a Sontheimer-Frederick directional coupler . It determines the return loss together with the resistors Rr and Rf. See figure 7 for the wiring. The inductance L1 and L4 are typically a piece of coax cable without jacket and without outer conductor. The inductance L2 and L3 is a winding on a ferrite toroid. A ferrite material 61 toroid FT50-61 fits nicely on a coaxial cable of 5mm diameter. Figure 7 • Sontheimer-Frederick directional coupler. 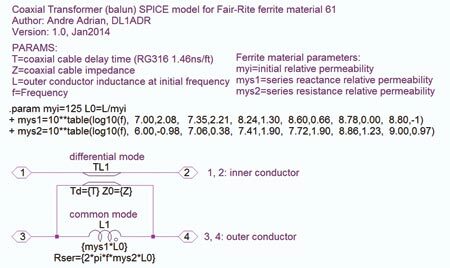 The SPICE simulation results are only as valid as is the MOSFET model. The author uses a model of his own fabrication. SPICE diode circuit elements simulate the voltage dependent capacitances Cgd and Cds. Capacitance Cgs and resistance Rs are part of the NMOS circuit element. Figure 8 • Vertical RF MOSFET model. First of all, this power amplifier still needs to be built. The given characteristics are SPICE simulation results. The author assumes that the real thing will behave like the simulation. There is a lot of experience with coaxial transformers since the days of Gerth, Guanella and Ruthroff that support the SPICE results. Chart 3 shows the input power, output power, supply power characteristics for different frequencies and different input levels. The powerful .STEP command of LTSpice makes this chart easily possible. Chart 3 • Amplifier input power (pin), output power (pout), and supply power (pdd). Chart 4 shows amplification, return loss and power added efficiency (PAE) for the same frequencies and input levels. All in all, the amplifier performance is above average. A peak PAE of 72% is mediocre, compared to the values of class E or F amplifier. But these amplifiers are single frequency amplifiers. It makes no sense to compare apples and oranges. 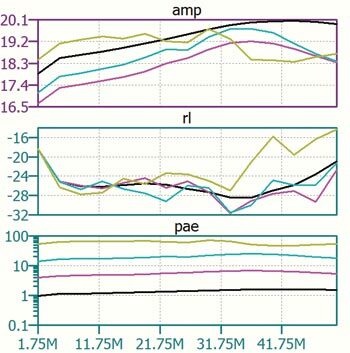 Chart 4 • Amplification (amp) in dB, return loss (rl) in dB and power added efficiency (pae) in %. Chart 5 shows the intermodulation behavior. The two input signals are 14MHz and 14.1Mhz sine waves. The LTSpice FFT function shows a 26dB difference between amplified input signals and intermodulation products at full output power. Chart 5 • Intermodulation test results. An amplifier without “real” transformers needs more ferrite cores. But these ferrite cores are smaller. The formulas for ferromagnetic cross sectional area do not apply for baluns. Within a balun, there is no conversion from RF current to a magnetic flux and back to another RF current. The RF current travels as transversal electromagnetic (TEM) waves thru the balun. The input section of the amplifier converts the impedance from 50Ω down to 12.5Ω. This is no input impedance match. It just reduces the influence of the gate source capacitance Cgs of the MOSFET on the frequency response. This amplifier has the strength to become a classic circuit. You design it in SPICE, you build it, and it works. The author started his carrier as an apprentice at Siemens AG. Later he studied computer science. He is also a radio amateur, call sign DL1ADR. Since 1991 he has worked for the German Air Traffic control agency DFS. His e-mail address is andre dot adrian at gmx dot net.